Ax Les Thermes is one resort made up of 3 areas between 1400m and 2400m. The areas of Bonascre, Saquet and Camples have something for everyone. Located south of Foix and just 35 km north-east of Andorra is the beautiful Pyrenees spa town of Ax Les Thermes. Popular with snowsports enthusiasts throughout the winter season, the surrounding mountains and valleys has lots of snowy terrain to discover. Skiers are attracted to the small town by the picturesque alpine views and the beautiful lakes and waterfalls. One of the main attractions is the ‘Bassin des Ladres’ hot spring located in the centre of the town, which is perfect for warming up your toes up on a cold day. Just 700m away there are a further 60 individual hot springs with water reaching temperatures of up to 78°C! The feature is over 750 years old and is one of the many outdoor activities tourists can encounter in Ax Les Thermes. The ski resort has over 127 snow cannons throughout the 80 km of terrain which allows for guaranteed snow coverage throughout the season. Ax Les Thermes sits at the bottom of the Ax 3 Domaines ski area and has access to over 80 km of skiable pistes. 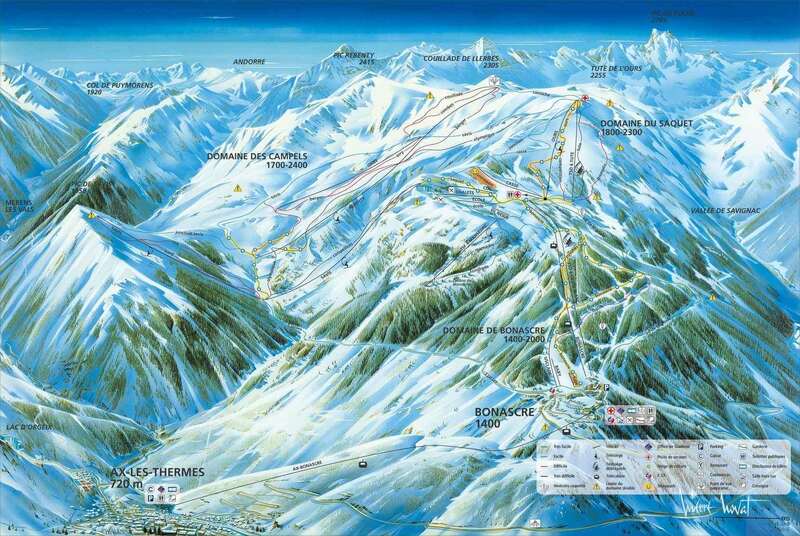 Accessible via a gondola, the area is made up of three ski areas of Bonascre, Saquet and Camples. Bonascre was the first area to open and there are areas available for all levels of snow lovers with beginner, intermediate and advanced areas for skiing, snowboarding, snowshoeing or walking. Located on the Plateau of Saqueut, snowboarders and freeskiers can enjoy the Natural Forest Snowpark. The snowpark is open for all levels with small to large kickers, rails and boxes to practice your techniques on. If you want to practice big air jumps, the resort also has a huge practice airbag that is open to the public on most days. There are plenty of ski schools throughout the Ax 3 Domaines area which offer training for skiers, snowboarders, advanced and freestyle. 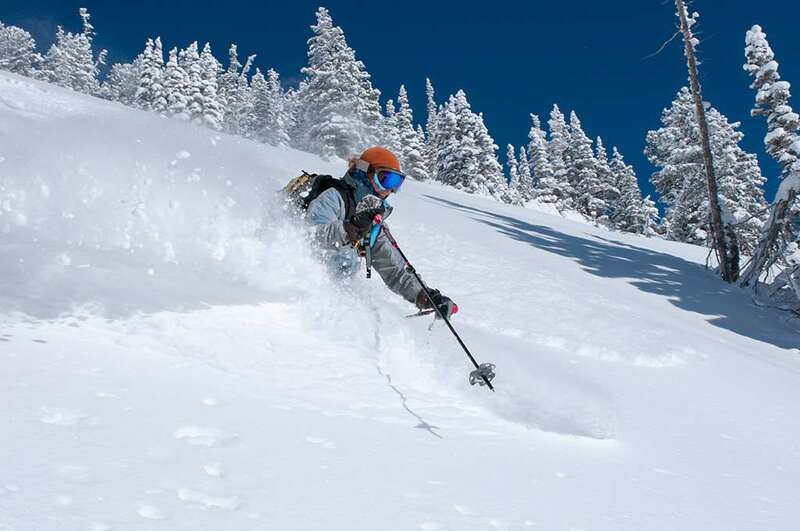 If you are looking for more of a challenge, the ski area also has a vast amount of off-piste skiing available. As these slopes are not signposted we would recommend getting a guide from a ski school as these should only be attempted by the more experienced skiers and snowboarders. The mountain activities don't just stop at skiing and snowboarding. Why not try something different like mountain biking on the snow? Powered by a caterpillar on the back and a ski fitted to the front this snowsport activity is definitely worth a try! For sledging lovers why not a go have at Snake Gliss? This fun activity is great fun for the whole family! Snake Gliss is led by a specialist guide and is made up of identical sedges joined together to make up a single train. Other snowsport activities include snowshoeing, mountaineering, nordic skiing, speed racing and many more. The three closest airports to Ax Les Thermes are Carcassonne (CCF), Perpignan (PGF) and Toulouse (TLS) and all within a two hour drive from resort.